Is Will Graham alive? The question lurked around the edges of the season three premiere of Hannibal, at least in the minds of Lecter and Bedelia. 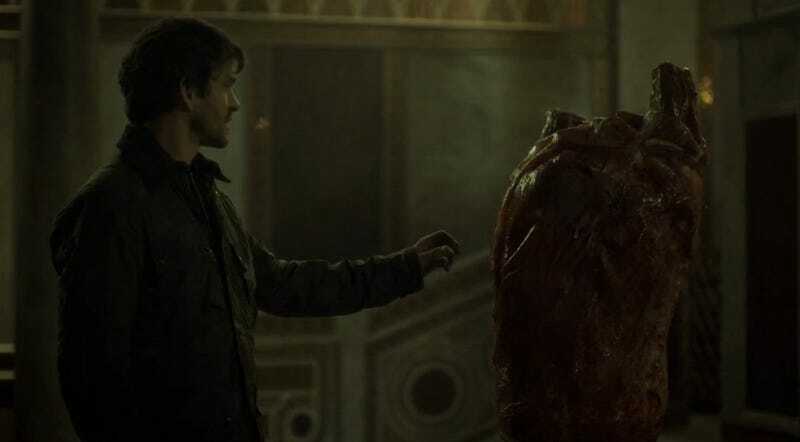 You and I, of course, knew that scrappy fella was alive, because as much as we love Hannibal, there’s no Hannibal without Will. But how did he survive? “Primavera” begins with a flashback to last season’s operatic finish. It’s still haunting as hell: “You were supposed to leave!” “We couldn’t leave without you!”; caress; stabby-stab-stab; tender hug; shattered tea cups; “Did you believe you could change me, the way I’ve changed you?”; OH GOD ABIGAIL’S JUGULAR; etc. From beneath the gushing ocean of blood, the teacup reassembles in dreamy-surreal style, and — he’s alliiiive! It’s Will, returning to the human race, bandaged and confined to bed in the most artfully-lit hospital room ever. He has a visitor: Abigail. She’s alliiive, too! Sporting a big ol’ bandage on her neck. “They told me he knew exactly how to cut me. They said it was surgical. He wanted us to live!” Of course he did? There’s some lingering tension. Abigail has some serious questions about Will’s behavior. For one: why did Will lie to Hannibal? “The wrong thing being the right thing to do was too ugly a thought,” is his complicated reply, and he reminds her that it’s pointless to wonder what might have happened, or who might not have been killed, if he’d done things differently. “This is the way it ended for us,” he says. “We don’t have an ending,” she replies. “He didn’t give us one yet.” And she’d like to find him, despite everything that happened. Will lets that sink in as he drifts back to sleep, and has a gnarly nightmare-memory-vision, watching himself with Hannibal in his office, burning papers and listening to the doctor describe the Norman Chapel in Palermo, Italy. There’s a skull on the floor, he says, and Will clears aside a sheaf of papers to reveal ... a skull on the floor. For just a moment, his mind drifts into the chapel, then we’re back at the hospital. Will stares at the ceiling, clearly planning a major Eurotrip to find Hannibal in Hannibal’s home world. Eight months later, he makes it. With Abigail. They’re strolling through the Norman Chapel, and she’s asking him about his religious beliefs. “What I believe is closer to science fiction than anything in the Bible,” he admits. “God can’t save any of us, because it’s inelegant. And elegance is more important than suffering. That’s his design.” Abigail wonders if Will is talking about God, or Hannibal? But Will doesn’t have the two confused. Hannibal, he supposes, would just love seeing the chapel collapse on all the people praying inside. As if on cue, the ceiling begins to crumble. The crumbling is all in Will’s imagination, but that doesn’t make it any less eerie. Even more eerie is Will’s discovery of Hannibal’s handiwork as it’s being puzzled over by the Italian police. (That grad student from last week who was into threesomes, if you’ll recall, has been displayed in a gruesome yet gorgeous manner, with his headless body shaped into a torso-sized heart.) He’s brought into the station to share his knowledge of Dr. Lecter’s ways, and jeeeeez, even the Italian cop shop is decked out in museum-quality glamour. While he’s waiting, he encounters one “Chief Investigator Rinaldo Pazzi,” in town from Florence. “You’re a long way from Florence,” Will notes. “You are a long way from Bal-tee-more,” Pazzi replies, wryly. Turns out Pazzi is a big Will Graham fan, or at least an authority on Will’s past misdeeds, and he’s got a good idea why Graham has been lurking ’round Norman Chapel. Their meeting is briefly interrupted, but it charges right back up when Will emerges from the station, and Pazzi spills the real goods: for 20 years, he’s been chasing a brutal killer who arranged a crime scene to look like Botticelli’s Primavera. He was known as “Il Mostro, the Monster of Florence,” who is also known as (surprise!) “Hannibal Lecter.” These guys have a lot in common, as it happens, and it looks like Will has met an important Italian ally in his Hannibal hunt — though Pazzi is intent on catching a killer. Will’s motivation for reuniting with Hannibal still remains unclear. As Will does his crime-scene thing, revisiting Tony’s corpse-as-heart display in his mind (“a valentine written by a broken man...”), the grotesque thing starts beating, then unfurls its limbs, which become hooves, sprouts antlers, and starts lumbering toward Will. The stag is back! But it’s not real, and he snaps out of it when Abigail appears. “He left us his broken heart,” he tells her, noting that he feels closer to Hannibal than ever now. “He misses us?” she wonders. Will tells her that Hannibal always follows several trains of thought at once, all for his own amusement. They share a tender moment, sitting together in the beautiful chapel, as Will wonders what if nobody had died that day. What if they’d all left together? Would they now be in some other world, some other reality? We get a taste of what he means when suddenly, just when she’s gotten finished rhapsodizing about having a place in this world, the wound on Abigail’s neck opens and blood begins gushing out. He’s been imagining her this entire time, it seems, willing her back into the world even though she died eight months prior. (A flashback confirms this; we also get some graphic close-ups of the surgery that mended Will.) As the camera pulls back, we see Hannibal watching from afar. Is he an imagined presence too? Pazzi returns to the chapel. The two men return to the subject of prayer, a theme that runs throughout the episode. “Are you praying to capture him?” Will asks. “You should pray he doesn’t capture you.” And as he has a vision of blood pooling on the floor, he advises Pazzi that if he could be content with it, he should let “Il Mostro” go. “I can’t do that any more than you can,” the Italian detective says.